Let me tell you I had quite a Friday! I went to get my hair done and I asked for sun beachy blonde, like a light golden brown and she colored my hair brown! AHHH!!! We totally both had different ideas in our head. After she did my hair, I practically cried and said where’s the blonde? She said my hair will lighten up, but that didn’t satisfy me, so I had her put some blonde streaks in my hair. Not sure how I feel about my hair. I will tell you, I am a natural brunette but I look so much better as a blonde. Brown makes me look so washed out. We shall see how it goes. Don’t you hate when things like this happen? I should have just said touch up my roots. Sigh…. Well anyway, I had to get that out, I feel so much better, thanks for listening! Now for today’s recipe. I have such a simple side dish, but it’s so full of flavor! I had left over tomatoes and my idea was large sliced tomatoes, but when I grabbed a tomato, they were starting to get a little to icky to eat! Yucky!! So I grabbed my grape tomatoes, and decided to make the dish a little different! Either large sliced tomatoes or little ones this is a fantastic dish and goes great on top of bread. All I did was take grape tomatoes, sliced them in half, added a bit of olive oil, salt, pepper and basil and a dash of Parmesan Cheese. Bake for 10 minutes until the tomatoes are soft, not split. I topped these little guys with some Balsamic Glaze that I bought from Trader Joe’s. 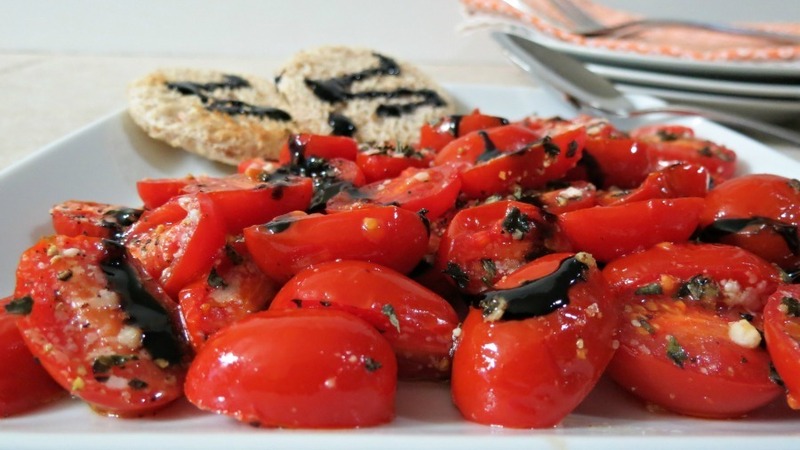 You can use balsamic vinegar or even a balsamic dressing. Oh so good! 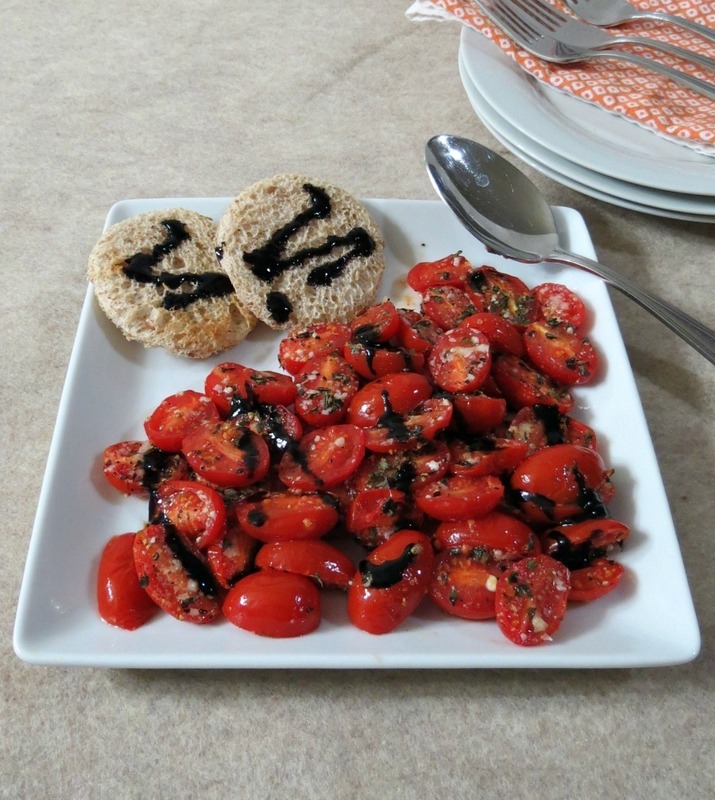 I love tomatoes with basil and balsamic! It’s a summer dish, but I think it’s good anytime of the year! Their is something about the flavor when you roast a tomato, it’s so robust and juicy! Mmmmm, I love it!!! I served them as a side dish with my grilled filet mignon. 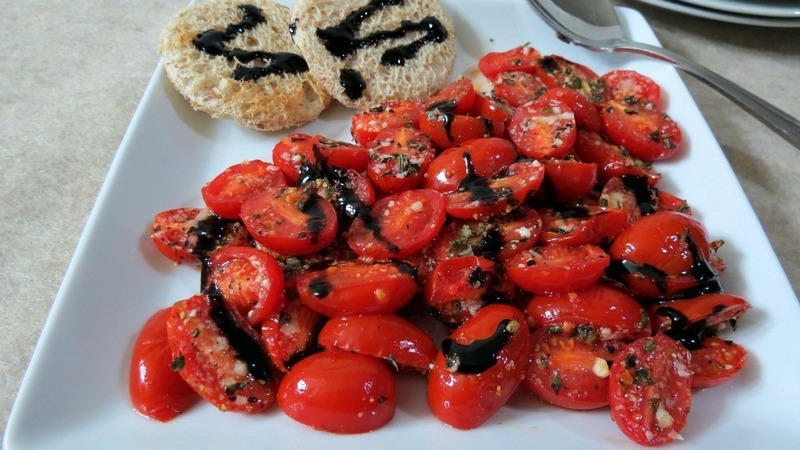 A robust, juicy tomatoes with basil, Parmesan Cheese and drizzled in Balsamic Glaze. In a bowl, toss tomatoes with olive oil and spread out on baking sheet. Sprinkle tomatoes with salt, pepper, basil and cheese. Bake in oven for 10 minutes, or until tomatoes have soften but not split. 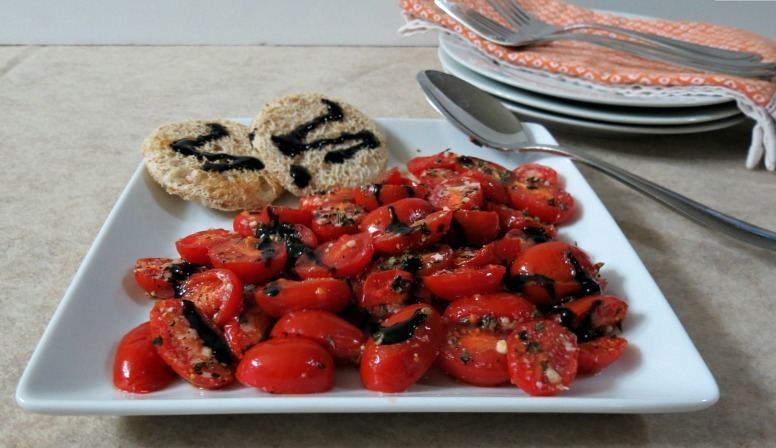 Add tomatoes to a bowl and toss with balsamic glaze or balsamic dressing. 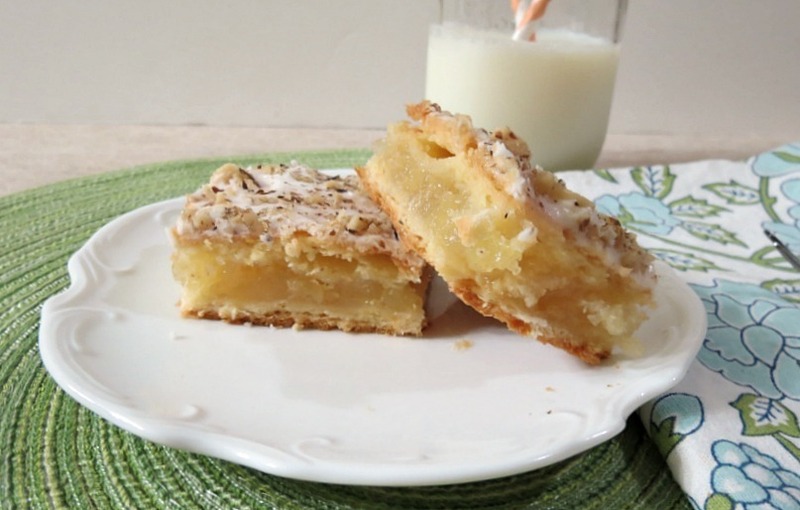 Sunday: Pineapple Square Bars – This is an indulgent treat that I made for my Husband. It’s simply amazing and so old school! I love this recipe! I didn’t healthify it because it wasn’t the thing to do! This is my Husbands Mom’s recipe and in respect to her and her family I didn’t make any modifications. 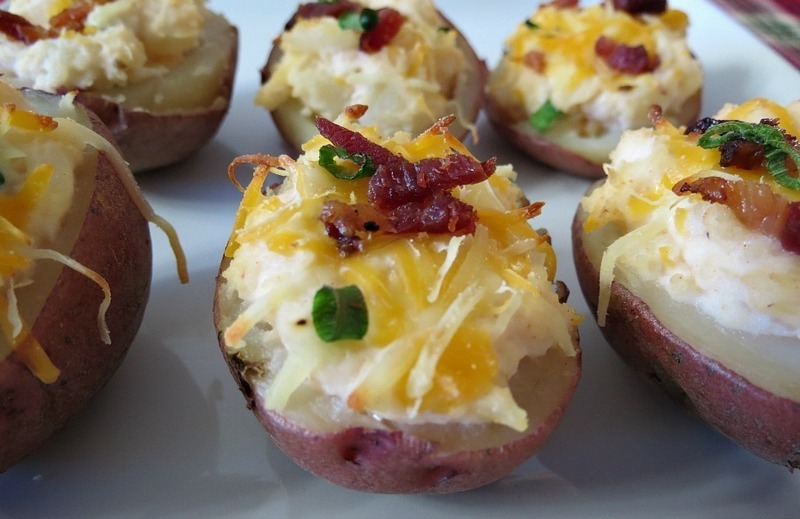 Tuesday: Loaded Potato Skins – Oh my gosh these are so good! Crazy good! These ended up being our dinner last Sunday! I was making them for an appetizer, while my Husband watched the big game, but we ended up eating them all and we were just to full for dinner! 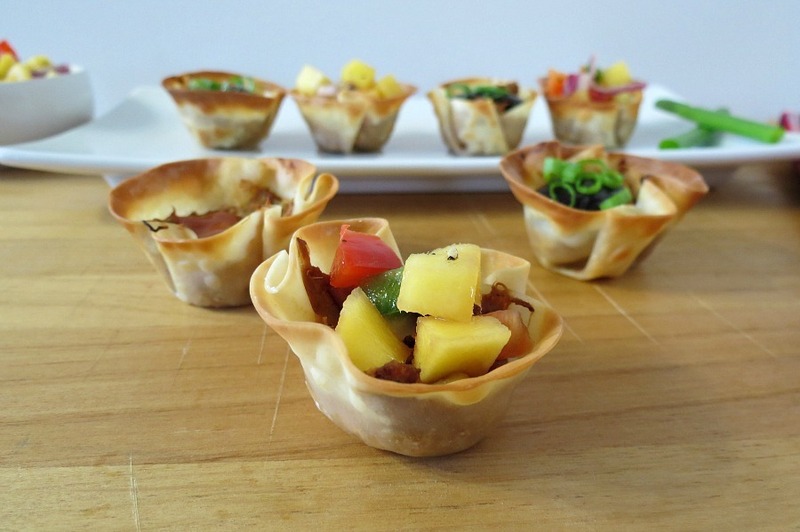 Such a great appetizer and low-calorie too!! 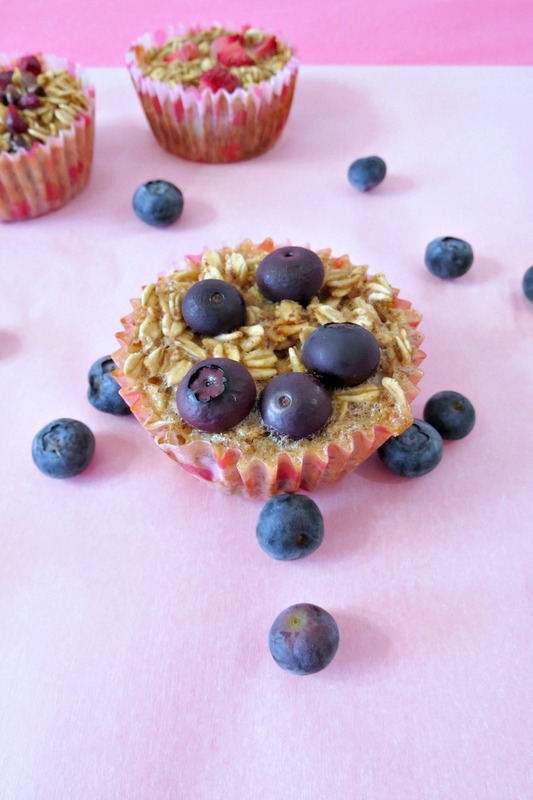 Wednesday: Individual Baked Oatmeal Cups – I love these! I have had one for breakfast everyday this week! I served it with a side of Greek Yogurt! So perfect and healthy!! I love that you can top them anyway you like!! My favorite is the pomegranate and chocolate!! I have had a major sweet tooth lately, so be prepared!! 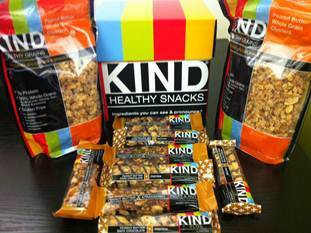 Thursday: National Peanut Butter Day and a KIND Giveaway! – No recipe this day but a wonderful giveaway! Thank you for telling me about the Groupon! Sure enough I got the offer the next day! I bought two and ordered the 6 packs of granola! You know I need to feed that granola addiction of mine. It’s funny but Friday night my Husband said he took some of my granola bars to work. I said granola bars? He said ya these, and they were my KIND Bars. He said he loved them. He took four out of the eight that I have! I’m glad he liked them, which surprised me because he doesn’t like those kind of bars! Now I need to order more for him! So don’t forget to enter my giveaway. Today is the last day! 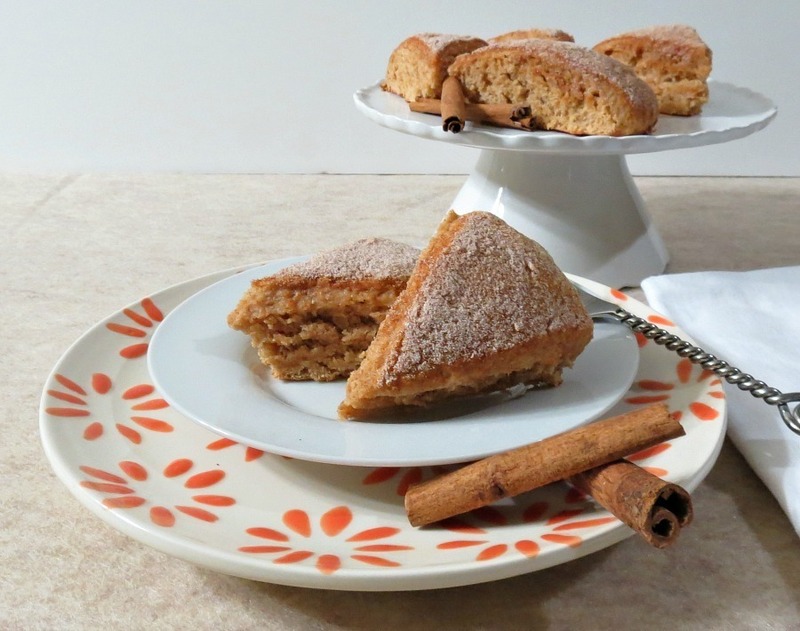 Friday: Snickerdoodle Scones – These scones are amazing and just under 100 calories. I was really surprised, but my co-workers loved them! I brought them out in the morning and they were gone by 10am. I’m really proud of the modifications I made in them to healthify them. I will be sure to make them again! My one friend said they would be really good with apples in them! I thought what a fantastic idea! I think I’ll take her advice and make them again that way!! Thanks Nicole! Well that’s it for this week! Wow, my recipes have been all over the place. My goal for this year is to use what I have! I have been spending so much on groceries that I decided I can’t let good food go to waste! I think I need to do some better planning! 🙂 So with that your getting odds and end recipes! P.S. 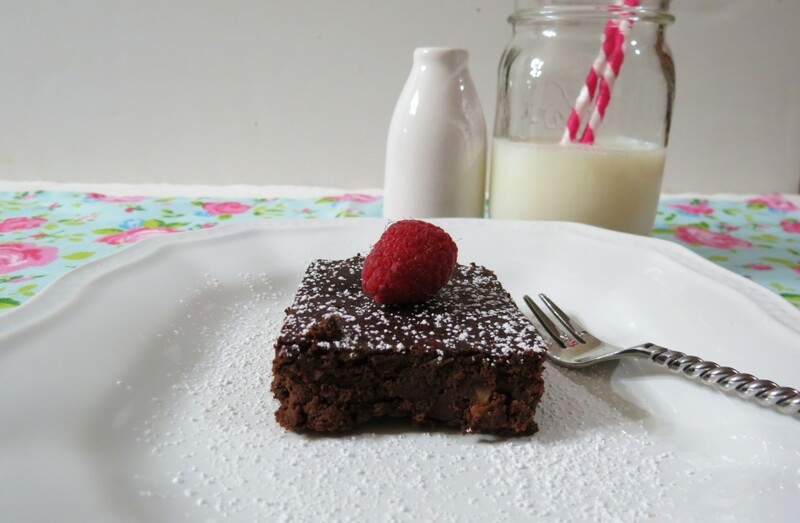 This weeks craving is: Black Bean Brownies! These are crazy good!! I can’t get over how good they are!!! I loved telling people after they had one that they were made with black beans! I laugh and laugh!! he he Try it, it may surprise you! Believe me I was skeptical, but I love them and so does my chocolate fanatic family! Thanks Tom! Your right about that!! I ate almost the whole batch! I love balsamic and tomato. It is a staple in our house, but I have not tried roasting them. Thank you for the great recipe! Roasted tomatoes are so good, you have to try it, especially with the tomatoes we have now, it really brings out their flavor. Your family is so lucky to have you in the house as the chef! These tomatoes look super juicy and delicious. I bet I could even get my kids to eat them!!! Lol Laura, you should tell them that! I cook to healthy for them! Mmmm these look so good!! Thanks Nicole!! 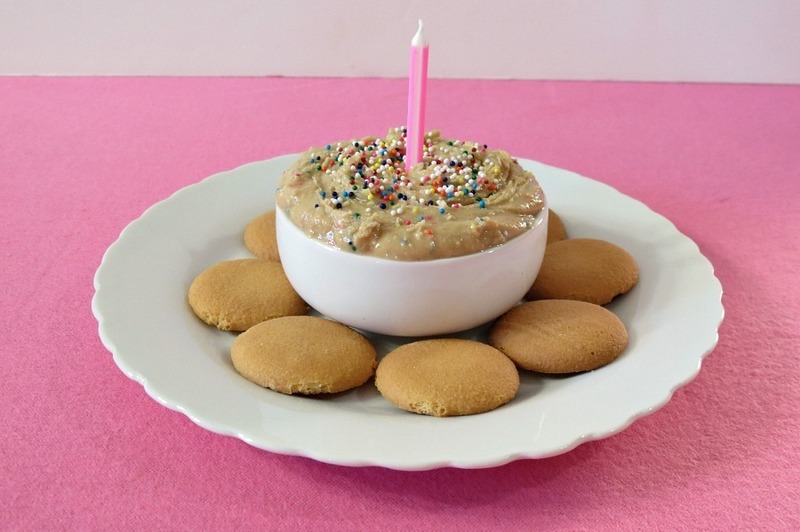 Loving the birthday cake cashew butter! It’s so fun and I love the sprinkles! I eat a tomato almost every day! For some people it’s apples or bananas, for me..it’s tomatoes! I love them! And balsamic. Could drink it. Perfect dish for me! I know I love tomatoes too! I eat them all of the time!! and p.s. how does she get from sun beachy blond to brown?! Girl I have had that happen and it’s the worst! It’s not like you can just change it the next day. It’s a gradual phase out/phase in. So sorry. Ugh. Seriously, that is awful. Been there. I don’t know? My appointment was cancelled so I’m going back on Thursday! I need some blonde streaks or something!! I have cartons of cherry tomatoes in the fridge to eat up and this is the perfect solution. 🙂 I love all that glaze! What a perfect side dish! Thanks Sally! I love simple and roasted tomatoes are so good! !